cryptonaut-in-exile: The Unicorn and the Wasp - "I need to investigate. You just buttle off." The Unicorn and the Wasp - "I need to investigate. You just buttle off." 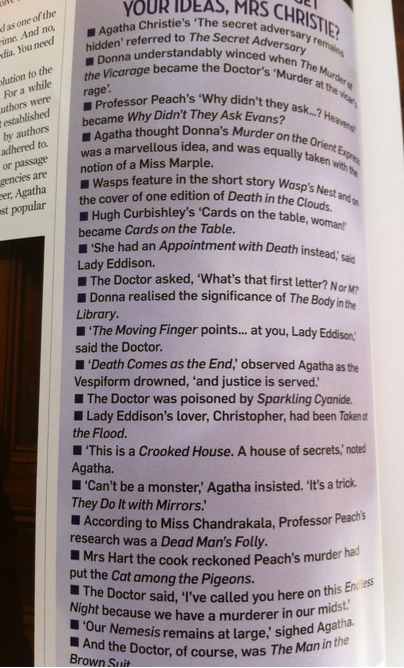 The Doctor convincing Agatha Christie she's the one to solve the murders. With this story, you've got to choke down a Clue™ homage that somebody wanted to force in really bad, so bad we've got a character name Professor Peach getting killed in the library by a giant alien wasp with a section of lead pipe. Now, I understand the Professor had uncovered a secret that the giant alien wasp had motive to kill to keep secret, but did he really have to be named "Peach"? And, when you're a giant half-alien wasp disguised as a normal human, do you really need to go full wasp to wield a lead pipe? No, only if the writer is trying to collect on a bet or was dared to be so audacious. (Also insecure about it -- kids today with their video games might not know about Clue™, so better have Donna spell it out. Twice.) Luckily, the questioning of the suspects scenes are much more pluckily self-assured and willing to plant tongue firmly in cheek. If the board game reference was too forced, this episode otherwise hits all the right notes. Well, until Donna attempts to comfort the jilted Christie by telling her how after her engagement ended in disaster, she was lucky enough to find the Doctor and he brought meaning back to her life. Earlier, Christie had chided her hostess for implying she was somehow incomplete without Mr. Christie. Yes, as Christie points out, a woman can make her own way in the world. 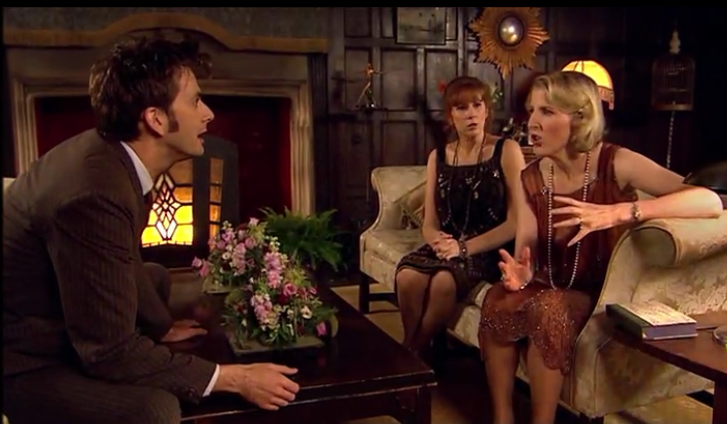 She ought to have been lecturing Donna. Also, on the anti-religionist front, the speech when the Reverend is about to go full Vespiform he contemptuously dismisses the teachings of the Christian Fathers at the orphanage and their worship of a tribal Sky God. He, after all, knows a great deal more about the universe than they did. Tennant, it's worth mentioning again, is like Tom Baker in that he brings so much energy and passion to every scene, it's genuinely fun to watch. The charades while he tries to expel the cyanide he was poisoned with, and his reactions to Donna's utter bollocksing her guesses based on his pantomiming is priceless. Those two worked so well together ... no companion since has had such a sparkling dynamic with the Doctor.